Gabriel Fontana on stage with Marthe Heltzel (l), policy advisor arts & creative industries, municipality of Rotterdam and Eléonore Delisse (r), Co-founder & Managing director at This is BOUW. Picture by Angeline Swinkels. 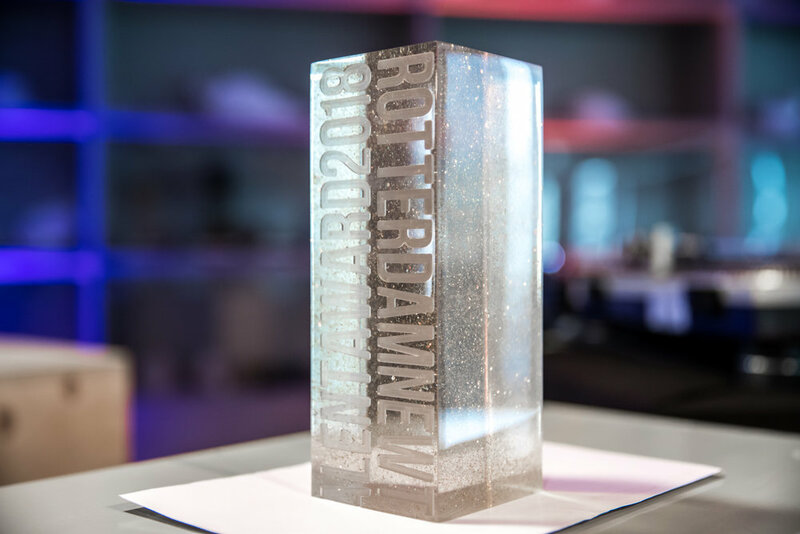 Rotterdam New Talent Award is an annual prize for newly graduated designers. Thanks to a complete support offered along a 5 months residency, the winners get a unique opportunity to transform their graduation project into the stepping stone of their professional career. 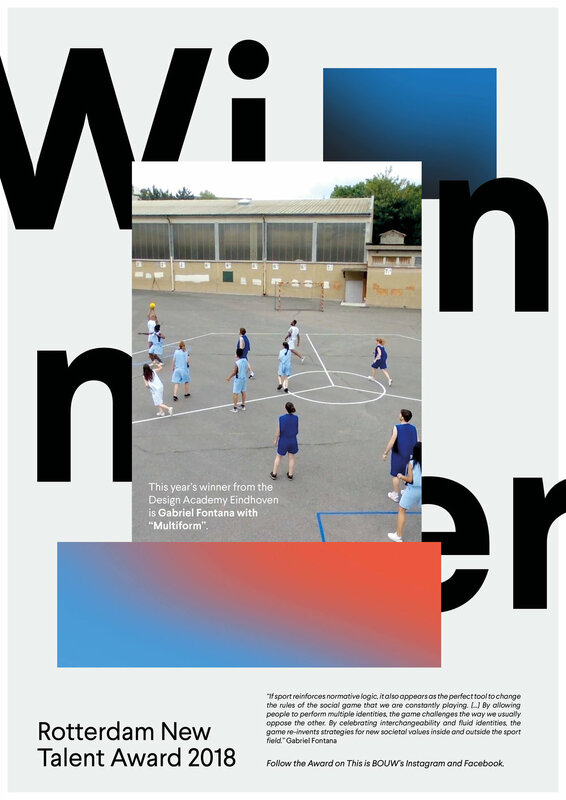 Rotterdam New Talent Award’s first edition is accessible to the graduated students of the school year 2017-2018 from the Design Academy Eindhoven and the Willem de Kooning Academy. It is open to all BA graduates and to the MA graduates of the Design Academy Eindhoven who are starting an entrepreneurial venture in the field of product and/or service design. 1 - All candidates must fill in the application form with one of their graduation project before July 1st 2018, 23:59. 3 - The winners will receive the award during a ceremony held in each school, and start the award residency in September 2018. Note: on the registration form it is not possible to save the entered data in the meantime to continue at a later date. We therefore recommend that you work out your text in a word processor such as Word before filling in the registration form. - the opportunity to exhibit process and final developments of the project. - You graduated from the Design Academy Eindhovenor the Willem de Kooning Academyin the academic year 2017-2018. - You want to become a designer and start as an independent entrepreneur. - You want your graduation project to become your first professional venture. - You want to develop and implement your graduation project in Rotterdam. - You are available from September 3rd, 2018 until February 3rd, 2019 included. Each project will be evaluated according to the quality of its concept, process and execution, to the relevance of the issue it addresses, to the potential of its impact on the targeted audience, and to its ability to transform into a successful entrepreneurial venture. One applicant per school will receive Rotterdam New Talent Award, and one graduate can get the “Jury Prize”. Eléonore Delisse + Laura Ferriere designers and creators of the Award. Rotterdam New Talent Award is a project by This is BOUW design studio, and is supported by Citylab 010.